For the Dot the Halls collection we wanted to create something completely different. We wanted to create a modern quilting collection using dots to form the designs instead of applique or fill stitches. We filled this collection with traditional Christmas designs re-imagined in a whole new way. We embroidered the designs on white fabric with brilliant bright colors of thread. 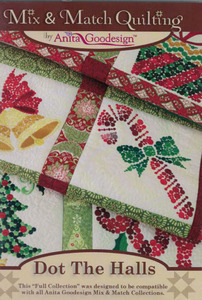 This collection also includes sashing blocks to create your quilt.